As the owner or manager of an ecommerce store, you know how beneficial it can be for your business to have a presence on Amazon. Of course, your competitors - both large and small alike - know it, too. 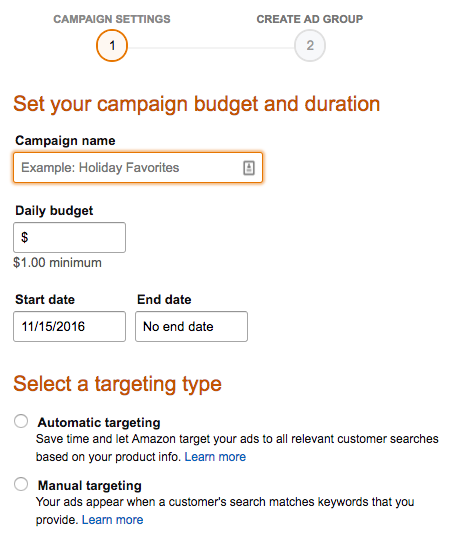 What are Amazon PPC Ads, and Why Should You Use Them? If you’ve run PPC ads on other platforms (such as Google or Facebook) before, you should have no trouble understanding how pay-per-click for Amazon works: Basically, you create ads for specific products to appear within search results when individuals use a certain term, paying for the ad only when the user clicks on your ad. The question is, why should your ecommerce business be interested in selling on Amazon and how can Amazon PPC ads help with increasing sales? For one thing, Amazon is by far the most popular online marketplace in the US - if not the entire world. According to a survey by CNBC during the 2017 holiday season, more than 75% of American consumers prefer using Amazon than any other online store or marketplace to do their online shopping. To add to this, 53% of sales generated through Amazon go to third-party companies that simply use the platform as a way to market their brand. In other words, most of Amazon’s customers use the platform to find products offered by other companies - not just products created by Amazon. Piggybacking off of these two points, there’s also the fact that those searching for products or brands on Amazon are almost certainly looking to make a purchase at some point in the near future. It is a product-focused platform, after all. Which is exactly what we’ll be discussing throughout this article. Before we dive into the meat of this guide, we should point out that gaining visibility via Amazon ads is not simply about outbidding your competitors. In fact, going this route could cause you to go way overboard in terms of your ad spend, to the point that the sales you generate barely make up for the amount of money it cost to make the additional sales in the first place. Your Ad Cost of Sales, and your Return on Ad Spend. Basically, your main goal for your Amazon PPC campaigns should be to keep your ACoS to a minimum, in turn maximizing your ROAS. That said, using ads on Amazon isn’t just about generating visibility; it’s about reaching those who have a high probability of purchasing your products. In this section, we’ll explain exactly what each of these look like, where they appear on Amazon, and the best use cases for each. Before we dive in, it’s worth mentioning that the cost of each type of ad varies depending on the product(s) you choose to advertise, as well as the industry in which you operate. For this reason, we won’t dive too deep into a discussion of pricing when comparing each type of ad. At any rate, let’s get started. As the name implies, Sponsored Product Ads are pay-per-click ads used to promote individual products based on the keyword or phrase used by an individual Amazon shopper. Sponsored Product Ads allow you to immediately boost visibility of products you offer that relate to a given consumer’s interests and/or search intent. This visibility is boosted even further on search results pages, as Sponsored Product Ads appear at the top of the list of results - above even top-rated or best-selling product results. The main disadvantage of Sponsored Product Ads is that, by nature, they can only include one product - meaning you’ll have to pay for multiple ad spots if you’d like to advertise two or more similar products. Headline Search Ads are pay-per-click ads that are also triggered when an individual searches for a specific keyword or phrase, but they are a bit different in nature from Sponsored Product Ads. As shown in the image above, Headline Search Ads consist of the brand’s logo, a custom headline, and up to three products related to the search term used. These ads appear at the very top of a search engine results page - above even Sponsored Product Ads. In addition to providing major visibility, Headline Search Ads allow you to showcase more than one item without having to create and pay for multiple ad spots. Furthermore, since Headline Search Ads allow you to present your brand’s logo, as well as a branded message from your company, this is a great option for companies looking to increase brand awareness and recall. However, Headline Search Ads are not without their share of drawbacks. For one thing, they typically cost much more than Sponsored Product Ads (with good reason, as mentioned above). That said, companies operating on a strict budget might have to pass on using Headline Search Ads until they’re ready to ramp up their ad spend. Additionally, Headline Search Ads direct searchers to a company’s main Amazon page (rather than to a specific product page). While this isn’t necessarily a bad thing, it does mean that those looking to check out a specific item will need to take an additional step along the way. In other words, Headline Search Ads may end up creating more “work” on the consumer’s end - which isn’t something you ever really want to do. Finally, because Headline Search Ads showcase multiple products, you’ll likely want to end up using broader search terms that relate to each of these products (rather than using a more specific keyword that relates to only one of them). Still, a well thought-out Headline Search Ad can certainly lead to major visibility for your brand as a whole. Product Display Ads are another form of Amazon PPC ad, but they operate differently than Sponsored Product Ads or Headline Search Ads. Instead of being triggered by search terms used by Amazon shoppers, Product Display Ads are triggered based on an individual customer’s interests and on-site actions. As the creator of a Product Display Ad, you can set your ads to be displayed when individuals visit a certain product detail page (e.g., that of a product being offered by one of your competitors), or when they visit a product detail page of a product that falls into a specific category. Choosing the latter option, you’ll be able to choose certain categories from Amazon’s browse tree to target. Product Display Ads are useful because they allow you to go beyond targeting keywords, taking the context of an individual’s online shopping session into consideration as well. Along with this, the proximity of Product Display Ads to the “Add to Cart” button all but ensures your product will be seen by those who are just about ready to make a purchase. While, as we said earlier, most Amazon users are in “buying mode” as it is, those who are hovering near the “Add to Cart” button are, for all intents and purposes, as close as possible to converting - making this the perfect spot to advertise your products. Since you, the ad creator, will define which specific product detail pages your Product Listing Ads appear on, you’ll need to be extra diligent when making this decision. That is, you’ll need to do some heavy research in order to know the optimal spot to place your ads. Also worth noting is that, although Product Listing Ads provide a pretty good opportunity for you to gain visibility among high-purchase intent consumers, such individuals are few and far between (when compared to, say, the amount of people who are likely to see your Sponsored Product Ads and Headline Search Ads). In other words, Product Display Ads might not be your best option if you’re going for a “wide net” approach. Amazon also allows ecommerce store owners to create video ads showcasing their brand’s products, to be displayed via Amazon’s website, mobile app, and Fire tablet wake screen. However, as video ads are not pay-per-click in nature, we won’t be covering them, here. Now that we’ve explained the various types of ads you can create on Amazon, we’re going to discuss how to actually create Amazon ad campaigns that generate visibility for your brand in the hopes of increasing sales numbers. To be sure, simply using Amazon ads won’t automatically lead to an increase in visibility or conversions. For one thing, if you’re targeting keywords that nobody uses, your ads aren’t even going to show up for anyone at all. Along with this, using “weak” keywords (which we’ll discuss in a bit) might lead to an increase in visibility, but probably won’t lead to an increase in conversions - which, of course, is the ultimate goal of running your ad campaigns in the first place. All this being said, you’ll want to choose your targeted keywords carefully and strategically, so that your ads appear to the right customers at the exact moment their purchasing intent is highest. For those just getting started with Amazon PPC ads, the best course of action is to begin by creating ads using Amazon’s automatic targeting option. At any rate, when running an Automatic Campaign, you’ll choose which products to advertise throughout the campaign, and Amazon’s algorithms will determine the optimal keywords to focus on for the campaign based on the items you’d manually chosen. By using the Automatic option, you’ll be able to quickly get your first campaign up and running without having to do much (or any) keyword research on your own. While you’ll eventually want to invest the time and energy it takes to create campaigns manually, this will act as a sort of primer to ensure that you’re heading in the right direction when you do so. While Amazon will automatically generate a new search terms report for you every few days, you’ll generally want to allow your Automatic Campaign to run for a week or two before you make any sort of decision based on the information you’ve collected thus far. After 10-14 days have passed, though, you’ll be ready to check out your Search Terms Report. (A quick note: You can also use tools like Sonar to find relevant and valuable keywords to focus on. With the Search Terms Report, you’ll be able to determine which specific search terms have generated the most impressions, clicks, and conversions. As we mentioned above, this will give you a good idea of which terms to focus your ad spend on as you begin to take manual control of your campaigns. One thing to note, however, is that Amazon’s Search Terms Report no longer tells you which products have generated the most engagement and sales throughout your campaign. Rather, the report explains which keywords, out of the ones Amazon automatically chose for your ads to focus on, have been the most effective. This means you’ll need to get a bit more granular by comparing your Search Term Report data with your sales data, looking for a correlation between an increase in sales of a specific product (or products) and engagement with ads relating to certain keywords. For example, if your Search Terms Report shows heightened engagement for the keyword “men’s hoodies,” you’d want to consult your sales reports to see which hoodie (or hoodies) have been selling better over the same time period. Let’s take a look at how and why you should use these options when defining keywords for your ads. Broad match keywords are intended to reach a rather wide range of audiences - hopefully capturing the attention of ToFu customers who may simply be browsing for a category of products, but who don’t know exactly what they’re looking for just yet. Ads focusing on broad match keyword phrases can be triggered when an individual’s search term includes any (or all) of the words within the phrase in any order. These ads can also be triggered even if an individual includes extra keywords within their search term. For example, if you set the keyword “cookie jar” to broad match, the ad may appear for those who search for “cookie jar,” “yellow cookie jar,” “ceramic jar for cookies,” or any variety of similar terms. Using broad match keywords is a great way to determine which keyword variations are leading to the most engagement and conversions. For example, let’s say that you notice your ad often shows up for individuals who search for “ceramic jar for cookies,” and a decent percentage of those who use this term end up purchasing your product. This would tell you that “ceramic jar for cookies” is a high-quality keyword for your product which you should focus your ad spend on moving forward. Phrase match keywords are meant to reach individuals whose search query includes your specific keyword phrase in order. These search queries can include other words or phrases, but they must include your keyword phrase in the order you define it. However, your ad would not show up for terms like “ceramic yellow cookie jar” or “ceramic Christmas cookie jar.” Again, the specific phrase you use must be included in your potential customer’s search term to be triggered. That said, you’ll want to funnel many of your best-performing broad match keywords into your phrase match campaigns, as you’ll have proof that these keywords are being used by individuals who have a higher purchase intent than the run-of-the-mill, “just browsing” consumers. The exact match setting goes a step further, in that it ensures an ad will only appear when an individual uses the exact phrase as defined by you. So, if your exact match keyword is “ceramic Christmas cookie jar,” your ad will only show up when an individual search for “ceramic Christmas cookie jar.” No variations or additional words can be used - it must be the exact phrase. That said, you only want to use the exact match option for your most valuable keywords: the ones that almost always lead to a conversion. Looking at things from the customer’s perspective, these are the keywords an individual uses when they know the exact type of product they’re looking for, and are now looking to choose a single product from the selection provided. Now, in addition to defining which keywords you want your ads to show up for, you’ll also want to define the search terms you don’t want your ads to show for. These negative keywords are those which may seem to be related to a specific product you offer, but don’t actually relate to a searcher’s intentions. For example, if you’re creating an ad focused on the keyword “women’s shoes” (and your product is women’s walking shoes), you wouldn’t want this ad to be shown to those who use the search term “high heels.” If you don’t specifically define “high heels” as a negative keyword, there’s at least a chance that Amazon’s algorithms may present your “women’s shoes” when an individual searches for “high heels,” since the two terms are closely related. Essentially, defining negative keywords acts as a safeguard against wasting ad spend on accidental clicks from customers who have no intention of actually purchasing your product. Again using the above example, if an individual searching for “high heels” is presented with your ad for women’s walking shoes, even if they accidentally click your ad, it will still cost you at least a bit. At any rate, you can use your Search Terms Report to begin defining your negative keywords by looking for terms that generate a high number of impressions, but a low number of clicks. In turn, this will also allow you to sharpen your focus on the keywords that are proving to be effective, as well. Now, if your ads do start appearing for the right keywords, this will hopefully serve to get your target customers to click over to your product detail pages. However, this doesn’t necessarily mean that these individuals will actually go through with a purchase. The quality of your product detail pages also plays a major role in your potential customer’s purchasing decision. That said, you want to be absolutely sure that your product pages are highly detailed, appear professional in nature, and truly capture the essence of the product you’re offering. To illustrate this point, let’s check out the product page for a rather mundane product: Post-it Notes. In the following sections, we’ll take a closer look at the most important aspects of this product page. To be clear, the Product Title section of your product page should include much more information than just...the title of your product. Also note that your product title should include the most relevant - and most valuable - keywords that apply to the product in question. Additionally, these keywords should appear at or near the beginning of the title. The example above illustrates this clearly, showing “Post-it” and “Super Sticky Notes” before providing more specific details about the product. By presenting this essential information right upfront, you make it easy for your potential customers to determine if your product is what they’re actually looking for (which, if it is, they’ll continue to dig deeper in order to make a purchasing decision). On the other hand, if your product title is rather generic and uninformative, your target customers will almost certainly pass over your listing - even if your product is exactly what they’re really looking for. Another important aspect of your product page is the product’s key features and description. Also, again, be sure to include your most relevant and valuable keywords within your product descriptions - but do so in a natural way without unnecessarily stuffing phrases that don’t fit. If Post-it has that much to say about its relatively simple products, then you can certainly do the same for yours. Along with providing detailed descriptions of your products, you also want to provide your customers with photographs of your products that are equally as detailed. As you can see, you have a ton of options when it comes to visually showcasing your products. You’ll want to include a mixture of standalone photographs (such as the first example in the above series) and lifestyle or action shots (i.e., the second and third of the above photos). You can also include videos of your products if you choose. Also, be sure to showcase your product from multiple angles, and to create photos focusing on specific features of your product as necessary. For example, if you sell jewelry, you’ll want to take up-close photos of the products in order to showcase their true quality. If Post-it can bring its Super Sticky Notes to life using high-quality, vivid photographs, you should certainly be able to do so with your products. For more information regarding product photography in general, check out this post on Sales & Orders’ blog. For Sponsored Product Ads and Product Display Ads, your ad copy will basically consist of your Product Title, along with some select information about your product. Again, we want to reiterate the importance of aligning the copy of your product title with the actual product being offered, as well as with the keywords you’re seeking to reach with said product. Now, things are a bit different when it comes to Headline Search Ads. As a quick reminder, these ads appear as banners above search results, allowing you to showcase multiple products, as well as your brand overall. In this regard, there’s no “one way” to go about creating the copy for your Headline Search Ads. That said, you’ll want to test different approaches over time, tweaking along the way in order to maximize engagement among your target audience. Before we wrap up, we want to mention the importance of setting up emails to be automatically sent to individuals once they’ve gone through with a purchase. First of all, it’s simply good practice to stay in touch with your customers as much as possible. Whether assuring them that their order will arrive shortly, or checking in to ensure they’ve been able to utilize the product successfully, these follow-up emails allow you to forge and maintain a relationship with all of your customers - no matter where they may be located. Secondly, by generating product reviews and other such feedback, you’ll gain a better understanding of what your company is doing right - as well as where there may be room for improvement. Going along with this, you can also use positive reviews as social proof to be displayed both on your Amazon pages, as well as your company’s own website as well. While it’s perfectly fine to send these automated responses as a springboard to further engagement, you should aim to manually take over the conversation should your customer reach back out to you for any reason at all. Not only will this further the level of engagement you generate with your customers, but it will also prove to them that they can trust your company to assist them as best as possible moving forward. As we’ve said, gaining a presence on Amazon can be incredibly beneficial for your ecommerce business. But it’s not just about getting your products in front of a ton of eyes; it’s about getting them in front of the right eyes. By following the strategies and tactics we’ve discussed throughout this article, you’ll not only be able to cast a wide net into the enormous sea of Amazon customers - but be able to catch the attention of those who best fit your target personas, as well. We've Launched Our Bing Shopping Campaign Manager!